Durable fiberboard E6-B manual flight planning computer. ASA's Flight Computer is made from solid, heavyweight fiberboard, an economical version of the aluminum model E6B including all its problem-solving features: compute time, speed, distance, altitude, true airspeed, and density altitude problems. 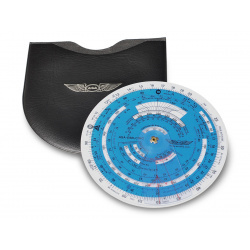 Conversions, nautical and statute scales, wind component grid and comprehensive crosswind correction chart included. Jeppesen's flight computers are the preferred manual computers of instructors and students alike. They solve basic or sophisticated flight problems. Jeppesen Student Flight Computer (CSG) is a full function, full size manual computer that's perfect for the budget-conscious student. Constructed of rugged plasticized composite material. It conforms to the instructions and examples in Jeppesen manuals, workbooks and audiovisual programs. 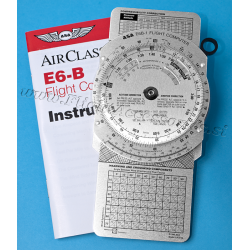 High quality aluminum E6-B manual flight planning computer. 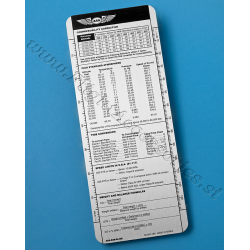 The best slide-rule-style flight computer on the market, with solid aluminum construction and easy-to-read lettering. 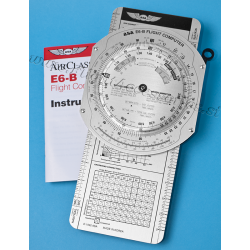 ASA's E6-B features a wind component grid and comprehensive crosswind correction chart, and on the other side the slide computes time, speed, distance, altitude, true airspeed, and density altitude problems as well as conversions. Nautical and statute scales are included. Pocket-sized brushed-aluminum aviation computer features high- and low-speed wind correction slide and high-speed compressibility table. This pocket-sized, brushed aluminum E6-B is a full-function aviation computer. Popular among military pilots, it features a high-speed and low-speed wind correction slide, high-speed compressibility table, vinyl case, and instruction manual. Micro E6-B performs all the standard manual flight computer functions, and it conveniently fits in a shirt pocket or glove box. The E6B Slide Flight Computer is the companion product to ASA's E6-B metal flight computer. Provides calculations for high-speed flight in the range of 220-700 knots or miles per hour. The E6B slide picks up where the traditional metal flight computer leaves off, providing calculations for the high-speed realm of flight (in the range of 220-700 knots or miles per hour). Pilots simply replace their current slide with this one, which then continues to use the circular computer from traditional E6-Bs. E6B Slide Flight Computer also includes a compressibility correction chart, ICAO Standard Atmosphere reference table, a worldwide time conversion table, speed limits for the United States, and the most frequently-used weight and balance formulas all of the pertinent formulas and information required for high-altitude, high-speed operations. Meets both FAR and JAR (international) requirements. The Asa E6B Circular Flight Computer combines high-quality construction with easy-to-read lettering to deliver the most efficient, accurate, and convenient manual flight computer available. Perform multiple calculations ranging from basic arithmetic and flight planning problems to complex in-flight computations. The wind side of the computer provides a graphic method of solving problems and displaying the answers in a useful form. Use the wind side for simple addition and subtraction problems and also to solve for true wind, winds in flight, true course and ground speed, true heading and true airspeed, and off-course correction calculations. The matte finish on the wind side of the calculator can be marked with a pencil during use, and easily wiped clean to allow input for the next problem. 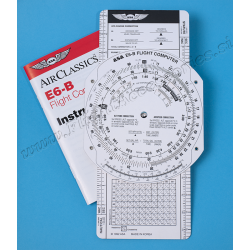 The E6B Circular Flight Computer is a great tool to use during flight planning, flight training or studying. Pilots flying faster aircraft at higher altitudes will find this computer useful in gaining insight to the external atmospheric conditions and the effects they have on in-flight performance. ASA Landing Pattern Computer is visual guide to the traffic pattern so pilots can see the entry, downwind, base, and assigned runway at a glance. Easily helps determine appropriate headings for each leg when landing or departing the airport — a great teaching aid! Use reverse side for right-hand patterns. This clearance is enough to invoke a rapid heart beat in the most experienced pilots. Although holding patterns may be used on any instrument flight, holding clearances are issued infrequently enough for pilots to get a little rusty on the procedures. Visualizing a holding pattern from a current position is one of the more challenging aspects of instrument flight. The CX-3 Flight Computer makes flight planning simple by taking confusion out of the equation. Fast, versatile and easy to use, the CX-3 delivers accurate results quickly and efficiently. It can be used on all FAA and Canadian pilot, mechanic, and dispatcher knowledge exams. Whether used for flight planning, ground school, or knowledge testing, the menu organization reflects the order in which a flight is normally planned and executed, resulting in a natural flow from one function to the next with a minimum of keystrokes. Multiple aviation functions can be performed on the CX-3 flight computer including those related to time, speed, distance, heading, wind, fuel, altitude, cloud base, standard atmosphere, glide, climb & descent, weight & balance, as well as a holding pattern function to help determine entry method and holding details. A calculator, clock, timer and stopwatch are also built in along with multiple settings for lighting, backlighting, themes, scrolling speed, time zones and more. Check for new CX-3 updates online at www.asa2fly.com/CX3. The update procedure is outlined in CX-3 Operator Manual, Appendix B. The CX-2 complies with Advisory Circular (AC) 60-11, Test Aids and Materials that May be Used by Airman Knowledge Testing Applicants. Users may bring the CX-2 with them to the testing centers for all pilot, mechanic, dispatcher, and FAA exams. * Numerous Aviation Functions Aviators can calculate true airspeed, ground speed, mach number, altitudes, fuel, headings and courses, time/speed/distance, winds, headwind/crosswind components, gliding information, and weight and balance. Users can change variables and recompute without re-entering the whole problem. The large, easy-to-read LCD screen displays prompts for fast and easy operation. Inputs and outputs are labeled and numbers are displayed with units. The menu organization reflects how a flight is normally planned and executed. This results in a natural flow from one function to the next with a minimum of keystrokes. The CX-2 features a simple keyboard and slim design. The hard-plastic carrying case protects the computer inside the flight bag, and fits on the back of the unit for storage while the computer is in use. The CX-2 has 16 unit conversions, including reciprocal conversions for nautical and statute miles, nautical miles and kilometers, feet and meters, pounds and kilograms, gallons and liters, time in H:M:S and decimal formats, Fahrenheit and Celsius temperatures, and millibars and inches of mercury. The CX-2 has two timers: a stopwatch that counts up, and a count down timer. The internal clock displays both local and UTC time and will keep time with the calculator turned off. Functions can be used together in “chain” calculations, where the answer to a preceding problem is automatically entered into subsequent problems. 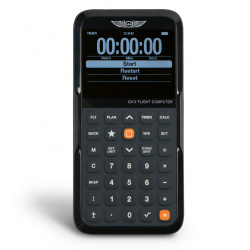 Standard mathematical calculations and conversions can be performed within each aviation function. The CX-2 uses four AAA batteries (included).